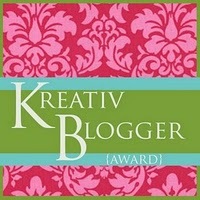 I’m very excited to be the recipient of a Kreativ Blogger Award. I am so honored to be awarded The Kreative Blogger award by Carrie at Carrie’s Experimental Kitchen, Melissa Placzek of Chin Deep and Nel of The Papercup Kitchen.I have been blogging since August 13, 2011. Today is my seven month Blogiversary! Thanks so much to Carrie Palladino Farias of Carrie’s Experimental Kitchen, Melissa Placzek of Chin Deep, Nel Marie Rennison of The PaperCup Kitchen and Christine Simmerman (Pickles) of Food Thoughts Of A Wannabe Chef for nominating me. Be sure to check out Carrie’s, Melissa’s, Nel’s and Christine’s blog. I met all four food bloggers on Facebook and immediately had a connection with all four of them. Even though we have never met in person, I feel like I have known them all for years. I am so inspired by these four incredible food bloggers. They have been food blogging for a lot longer than I and I learn so much from them everyday. Being recognized as a Kreativ Blogger has opened up my exposure to new readers and followers. I hope that those I nominate will embrace this opportunity and accept the challenge to share more about themselves as well as identify other blogs that they think stand out! I have had lots of fun exploring other blogs. And here are my nominations! I love planning parties and having parties. I will make up any excuse to have a party! I have two beautiful children and three wonderful step children and an amazing husband. I like to make simple recipes that don’t make a big mess in the kitchen, one pot wonders! I like to dream up recipes that involve lots of cheese. I collect coats, shoes and glasses. I hoard food, especially now that I have my new pantry, if a disaster happens, you can always come to my home, we could probably live for another 5 years on what I have stocked away. And there you have it: my 6 nominees and some little-known facts about this blogger. Be sure to visit the blogs of my nominees. Although all bloggers love traffic and new followers, it is the comments that keep us motivated to keep on plugging away. So please leave comments when you visit. Who knows, you could be the next nominee. Congrats! YOu have a wonderful blog! Nettie, I loved reading more about you! So glad to have met you through blogging and to see your blog being recognized. I always find inspiration when I visit!